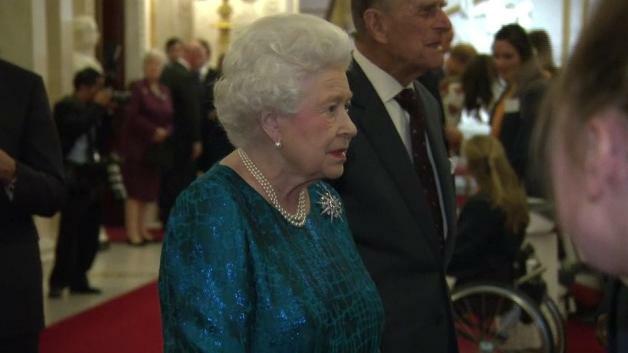 The Queen and other members of the Royal Family hosted a reception for Team GB's Olympic and Paralympic athletes at Buckingham Palace. For more: Telegraph video and article. I think she went with a dress zazzy enough to coordinate with those bright medals and their colorful ribbons, just in case the opportunity opened up to swipe one. It's what I would do. But she came with her own bling, of course. The Jardine Star's going to have to step it up if it wants to make the list of 2016 favorites. Earlier: The Queen received the Governor of South Australia, the Hon. Hieu Van Le, and his wife, Mrs. Le, for an audience at Buckingham Palace. The Round Cambridge Emerald's on its third appearance for the year. All three have been at Buck Pal audiences, and I'm totally on board with making this the new "audience brooch" standard.